Mike Lawson was born and raised in southeastern Idaho, Mike and his wife, Sheralee are both four-generation natives of Southern Idaho. Mike has fished the local trout streams in this part of Idaho all of his life, especially the Henry's Fork. He taught school in St. Anthony for 6 years and worked as a fly-fishing guide during the summer months. Mike and Sheralee also tied flies commercially for many years. In 1977 they opened Henry's Fork Anglers fly shop at Last Chance, Idaho. The shop is a full service fly fishing specialty shop and outfitter with the finest in flies, tackle, outdoor clothing and related items. Mike remains as general manager after selling the business to Mark Rockefeller in 1999. Mike Lawson was born and raised in southeastern Idaho and has fished the Henry's Fork, a classic spring creek, his whole life. Mike worked on his latest book, "Spring Creeks", for over 12 years producing a comprehensive work about fishing spring creeks and tailwaters. You'll enjoy hearing Mike share his knowledge about fishing spring creeks and tailwaters on this show. Mike has lead fly-fishing groups to Alaska, New Zealand, Patagonia, Australia, Tasmania, Christmas Island, Mexico, Belize and the Florida Keys. His first book, Fly Fishing the Henrys Fork, was published in June 2000. Co-authored by Gary LaFontaine, it is an all-inclusive guide on how and when to fish this great trout stream. 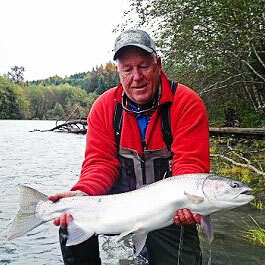 Mike has written many articles on fly-fishing in several magazines including Fly Fisherman, Fly Fishing for Trout, the Fly Fisher, Trout Magazine and the American Angler. Mike is contributing editor for Fly Fisherman Magazine. His photographs have also appeared in many of these publications. He has been featured on the cover photos of several of fly-fishing's top publications. Stackpole Books published his second book, Spring Creeks, in September 2003. Mike worked on Spring Creeks for over 12 years. It is a comprehensive work about fishing spring creeks and tailwaters. He has also contributed to several books on fly tying, fly-fishing, wild turkey hunting and upland bird hunting. Mike is also featured in several fly fishing videos including: Tying Western Dry Flies with Mike Lawson and Jack Dennis, Tying and Fishing Caddisflies with Gary LaFontaine and Jack Dennis and Fishing the Golden Ring by Gordon Eastman. His latest video Tying Flies for Spring Creeks and Tailwaters, was released in 1998. During the off season he conducts slide programs and fly fishing seminars for sports shows, fly fishing clubs and fly shops throughout the country. Mike Lawson was part of the Traveling Fly Fisherman with Jack Dennis and Gary LaFontaine. This group appeared throughout the U.S. and Canada presenting two-day seminars on fly tying and fly-fishing. Mike is currently a member of Team Sage, Scientific Anglers Advisory Team, Columbia Sportswear Pro Staff and Action Optics Pro Staff. He has also been a contract fly tier for Umpqua Feather Merchants since 1979. His flies are featured in almost every specialty fly shop and fly-fishing mail order catalog. Mike is also an active conservationist. He was a founding member of the Henry's Fork Foundation, serves on the board of the Jackson One Fly Foundation, a life member of the Federation of Fly Fishers, a life member of Trout Unlimited and an active member of the Nature Conservancy, Conservation Fund, Teton Regional Land Trust and several other conservation organizations. Mike and Sheralee have a beautiful home overlooking the Henry's Fork in St. Anthony. They have two sons, Shaun and Christopher and one daughter, Jeanette. Shaun is the general manager of South Fork Outfitters in Swan Valley, Idaho. Jeanette is a computer specialist for Buck's Bags in Boise, Idaho and Chris guides for Henry's Fork Anglers in the summer and attends BYU-Idaho in the winter where he is majoring in recreational leadership and business. For more information on Mike's fly shops, guiding service, and fly fishing gear visit his web sites at Henry's Fork Anglers or South Fork Outfitters.